A data scientist needs to be able to interpret and communicate data, starting with their own background info and history. Learn how to write a killer data scientist cover letter with our downloadable sample and writing tips below! I was pleased to learn of the available Data Scientist position at [Company name] posted on [website]. With my Master of Science in Statistics and four years of experience managing data-related solutions under my belt, I am confident I will be a valuable asset to your team. In my current role as a Data Scientist at Microsoft, I have been afforded the unique opportunity to spearhead a project focused on big data processing. This project has allowed me to drastically expand my predictive analytics and behavior analysis capabilities. Through my management, the project has produced substantial profitable results for Microsoft. I am well versed in deriving viable solutions to complex business problems through big data analysis and management. During my position with Hewlett Packard, I worked extensively with machine learning and data mining techniques to infer marketing insights and forecast sales. I was responsible for using data visualization techniques to increase the usability and accessibility of data for the sales and marketing departments. Working closely other departments allowed me to hone my interpersonal skills and the ability to present complex technical information to non-technical personnel. Thank you for your time and for considering my candidacy for this position. I look forward to hearing from you in the near future to schedule an interview. StackShare — Given that you are applying to be a data scientist, it only makes sense that you research the company’s tech stack if the information is available. Luck for you, companies around the world have gone public with what technology they are using. It’s as simple as searching the company you are applying for on StackShare, or other similar sites, for a behind the scenes peek at the technology stacks they are using. The Company Website — You can learn a lot about a company from their website. It will likely include all of the information they want potential customers, employees, and competitors to know about their values, products, history, and company structure. Make sure you check out the “about us” page and read their mission statement. Annual Report — If you are applying to a publicly traded company, their annual report is expected to be available online. This is an excellent way to gain a comprehensive overview of the company’s operations and financial position from the preceding year, as well as upcoming goals. Annual reports often include the following documents: statement from the CEO, fiscal years balance sheet, cash flow statements, auditor’s report, Corporate Social Responsibility (CSR or goodwill) report, stock information, Management’s Discussion and Analysis (MD&A), and much more. Social Media — Given that it is 2018, the company you are applying to is probably active on Social Media. Taking a look at their Facebook, Twitter, and Instagram pages is a great way to learn more about the company’s personality and upcoming goals. 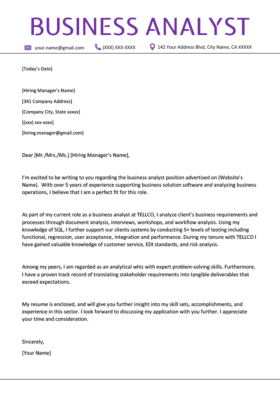 It would be a pleasure to learn more about [company]’s expansion plans and provide further insight into how my highly developed data analytic abilities, experience managing large data sets, robust predictive analytics, and machine learning skills can help your company achieve these results. Not sure how to format your cover letter? We’ve got 40+ free, professional templates for you to use! As a data scientist, it can be easy for your contributions to the bottom line to get lost or be misunderstood. However, you know that your ability to extract meaning from and interpret data makes a sizable difference in a company’s operation. If you want to immediately grab the hiring manager’s attention when they pick up your cover letter, use metrics to display the tangible results of your work. You can easily accomplish this by using the quantified bullets, those referencing changes in time, percentages, or dollar amounts, from your resume on your cover letter. If you haven’t started writing your data scientist resume don’t worry — we have a full guide on how to craft the perfect data scientist resume, including downloadable templates for you! Need more information on how to beef up your resume with quantities? Follow this guide to writing achievement-oriented resumes to find out everything you need to know. Spelling, punctuation, and writing style may seem arbitrary, but ignoring them on your cover letter could be the reason it lands in the recycling. The hiring manager is using your cover letter as a beta testing ground to analyze your attention to detail, thoroughness, and observation skills. 49% of hiring managers will throw out a cover letter that contains spelling errors. 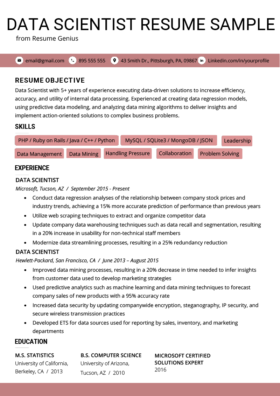 Think of your resume as a critical data set — you would never hit submit without refining the set with different data filtration techniques in order to identify queries, redundancies, and fragmentation. It is only logical that you would treat your cover letter with the same care. Unfortunately, running a simple Word spell check just won’t cut it when it comes to your cover letter. In order to reduce the margin of error, we suggest having a secondary source proofread and critique your resume. Luckily, there are a number of online resources specific to resume correction who will review your resume and get it up to scratch. So, no problem if you aren’t an English buff — there are cover letter connoisseurs out there that apply the same scrutiny to your cover letter that you would to finding data corruption. Now how do you bring your thoroughly researched, quantified, and immaculately written cover to a close? For instance, this concluding cover letter sentence shows the candidate’s confidence and eagerness to continue with the application process. Great work — you are petabytes ahead of when we started! Now you can get to work crafting a superb data scientist cover letter. Or if you are in a rush, you can skip right to the finish line within minutes by simply using our impressive cover letter builder that will do all of the work for you.